This popular proverb in the Levant roughly translates to, “In your dreams”, and reflects the hopeless situation of these Syrian refugees living in Jordon. The burdens of violence are present in their scant belongings; heavy mementos that remind them of what they have lost in the war. Like many other displaced people around the world, mobile phones have become precious talisman to them, filled with messages of love, lullabies, and hope shared between their husbands and boyfriends, other family members and friends. Brief moments of levity are a rare occurrence in a life that has come to be defined by a vicious cycle of poverty, isolation, and suffering. 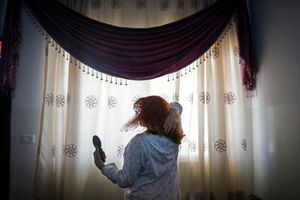 Habjouqa's photos explore the complicated intimacies of everyday life for these Syrian women who have been left behind. They cling to the hope that soon their family will be reunited again, yet at the same time, they grapple with the knowledge that most likely they will never see them again. 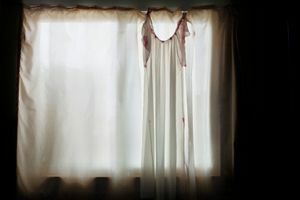 Born in Jordan, Habjouqa moved to Texas at a young age and spent years travelling back and forth from Jordan to the US until 2002 when she returned to the Middle East. She presently lives in East Jerusalem. Tanya’s practice focuses on gender, representations of otherness, dispossession and human rights, with a particular concern for ever-shifting sociopolitical dynamics in the Middle East. Tanya became a nominee of NOOR Agency in 2016. She approaches her subjects with sensitivity, but also with an eye for the absurd. She is the author of Occupied Pleasures, published by FotoEvidence which was heralded by TIME magazine and the Smithsonian as one of the best photo books of 2015 (winning her a World Press Photo award in 2014). 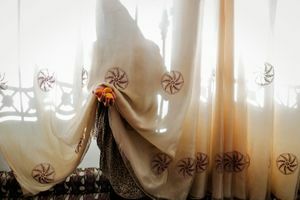 Tanya is a founding member of Rawiya, the first all female photo collective of the Middle East.